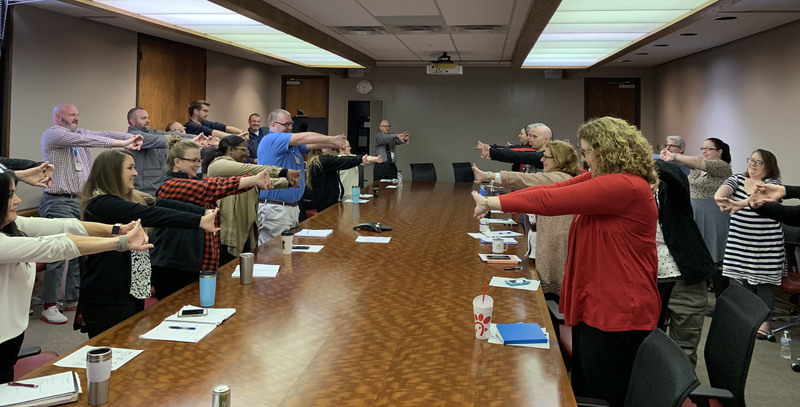 Employees from the UAMS Office of Communications and Marketing stretch during a team meeting. 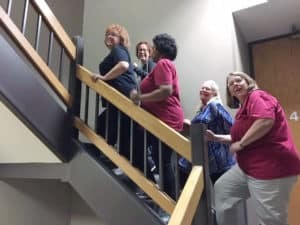 April 9, 2019 | In the month of February, UAMS had its first challenge for wellness. The Show Us Your Moves UAMS challenge used the hashtag #showusyourmovesuams on Facebook, Twitter and Instagram. The challenge encouraged employees and students to post a photo on social media tagging the Get Healthy UAMS page and using the hashtag. Alexa Rea leads friends and coworkers up the stairs during the Show Us Your Moves challenge. Dr. Patterson kicked it off with the announcement video and our employees showed up for the challenge. The latest challenge is the UAMS 10,000 steps challenge, which is going on through the month of April! Use the hashtag #10000stepsuams and tag our Get Healthy UAMS social media accounts throughout the month. Let’s get moving!